Several newsworthy events took place at this past week’s annual meeting of the Great Lakes Commission. For those unfamiliar with the Great Lakes Commission, it is comprised of members from each of the eight Great Lakes states with associate members from the Canadian provinces of Ontario and Québec. Each state may assemble a delegation of three to five members, largely comprised of senior agency officials, legislators and/or appointees of the state governor or premier. In our view, the biggest news was the announcement by John Goss that a 53-inch, 82-pound Asian carp has been caught in a lake near Chicago which connects to Lake Michigan. Goss is the Asian carp director for the White House Council on Environmental Quality. This “real world” incident comes after numerous reports from last summer involving positive DNA samplings for Asian Carp which had been found in Lake Calumet – the largest water body in the City of Chicago. Both the lake and river connect directly to Lake Michigan and are well downstream of the electric “barriers.” As of July 6, 2012, 24 of the then 28 positive DNA tests for the Silver strain of Asian Carp came from the lake and connecting river. It now clearly seems to be a race between two proverbial horses. 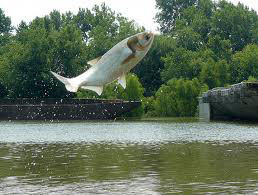 One is the Asian carp itself, seemingly desperate to make its way into the Great Lakes. The second horse represents those who have coalesced around the goal of a permanent physical separation between the Great Lakes and Mississippi River basin. Given the budgetary challenges at both the federal and state levels, together with today’s extreme political polarization, it would seem that the smart money is now being placed on the horse being ridden by the Asian carp. What is new, however, is the steady rise in surface water temperatures. Despite this year’s heavier snows and spring rains, low water is likely to be a long-term problem as evaporation rates continue to rise due to increasing surface water temperatures. Levels have been mostly below normal on all five Great Lakes since the late 1990s, but the drop-off has been most severe on Huron and Michigan. Although the level of Huron-Michigan has jumped 20 inches since January of this year, it remains 17 inches below its long-term average. Others, however, continue to argue that this lake level pattern is only partially climate related. Groups representing the Georgian Bay region continue to believe that dredging and other lake bottom-based activities have eroded Lake Huron’s southern end, thereby accelerating the flow toward Lake Erie. In spite of the belief of some in the Michigan State legislature, declining Great Lakes water levels does not appear to be a problem that we will be able to dredge our way out of.